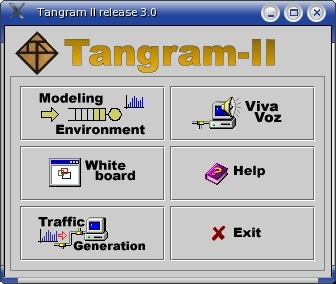 TANGRAM-II is an environment for computer and communication system modeling and experimentation, developed for research and educational purposes. It provides a general user interface based on an object oriented paradigm and a variety of solvers to obtain the measures of interest. The environment also includes modules useful for computer network experimentation, traffic modeling and multimedia tools to aid in the modeling process and collaborative work. The TANGRAM-II manual explains the tool in detail and includes several examples to help the user. Note: We currently use Ubuntu Linux 12.04 LTS x86 (32 bits) to develop, test and maintain Tangram-II. Click the buttons for further information about each module.